It's a bittersweet review this week as we say goodbye to 'Rat Queens' for the foreseeable future. Co-creator and writer Kurtis J. Wiebe decided to put the book on hiatus for the time being. Just when the series was back on its feet and on a bit of a roll we'll have to wait for its next chapter. A book that started out so promising with a fun adventurous spirit led to some tumultuous periods of upheaval and taking with it the strength of its characters and narrative focus. Wiebe and artist Tess Fowler along with colorist Tamra Bonvillain seemed to have found a cohesive rhythm over the last three issues but the break between issues hurt that momentum. This indefinite hiatus makes issue sixteen all the more melancholy. The gang is back in Palisade sans Hannah and they realize things aren't as they were after being away for six months. Dee, Violet, and Betty find the streets empty but their tavern full of rowdy newcomers making them feel like strangers in their own town. Luckily, Violet reunites with Dave for some much-needed TLC, Betty goes mushroom shopping and Dee just wants to get drunk. 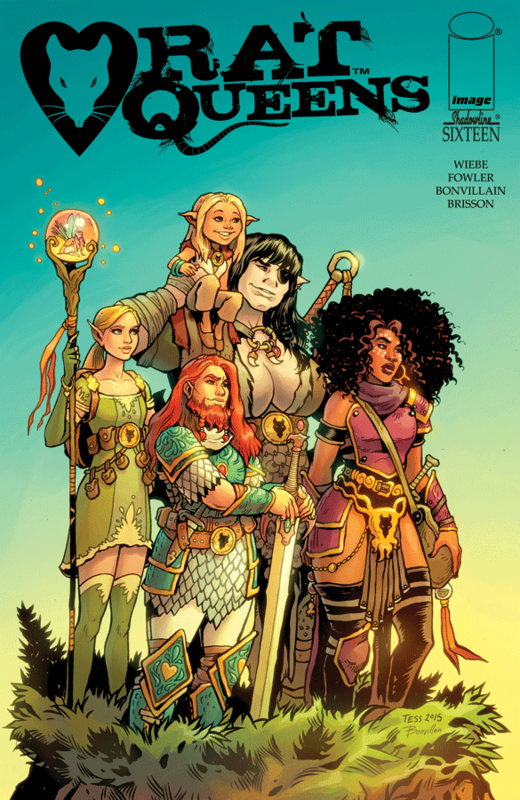 It's not a very eventful issue but more of a chance for the Rat Queens to relax in a familiar setting looking to get their mojo back like the series itself. It ends in a mysterious cliffhanger we hope to get cleared up someday. Fowler has made the Queens her own. Her designs have evolved into a comfortable place where there's more detail and consistency with the characters. The crowded bar scene was a feast for the eyes and the color work by Bonvillain adds a lot of warmth and boldness to the panels. And the bug-squashing sequence was an unexpected joy of art and cathartic release for Dee. When 'Rat Queens' returns Fowler and Bonvillain should be the art team. I want to see more of their great talent in this fantasy world. 'Rat Queens' was the fantasy title with attitude, humor, and badass maidens. Things fell apart along the way and Wiebe has been looking for his mojo back ever since. With Fowler and Bonvillain on board, the title seemed to be getting back on its feet like it does in this genial and entertaining issue. However, Wiebe has decided to put the book on hiatus but we hope for its return because the world needs a pack of booze-guzzling, death-dealing battle maidens-for-hire.